Each summer, Edinburgh Parks and Recreation offers our Rec League Baseball, Softball and T-Ball. Our Sports Complex has four brick dust covered fields for softball/baseball, a concession stand, bleachers, and a fenced in, covered playground to entertain the younger attendees. Our goal is to give our youngest citizens a place to play safely and learn to work with a team, enjoy healthy competition and work to improve their talents and abilities. With our family friendly facility and our amazing volunteers, we will have everyone singing "take me out to the ball game!" Summer Rec League Baseball, Softball and T-Ball registration begins the beginning of February and lasts until the first week of March. Sign-ups are held at the Edinburgh Park and Recreation Building. Age groups range from 3 to 16 years. T-ball is offered for both boys and girls 3 to 6 years of age. Girls 7-16 years can play in different divisions, as well as, boys 7-15. 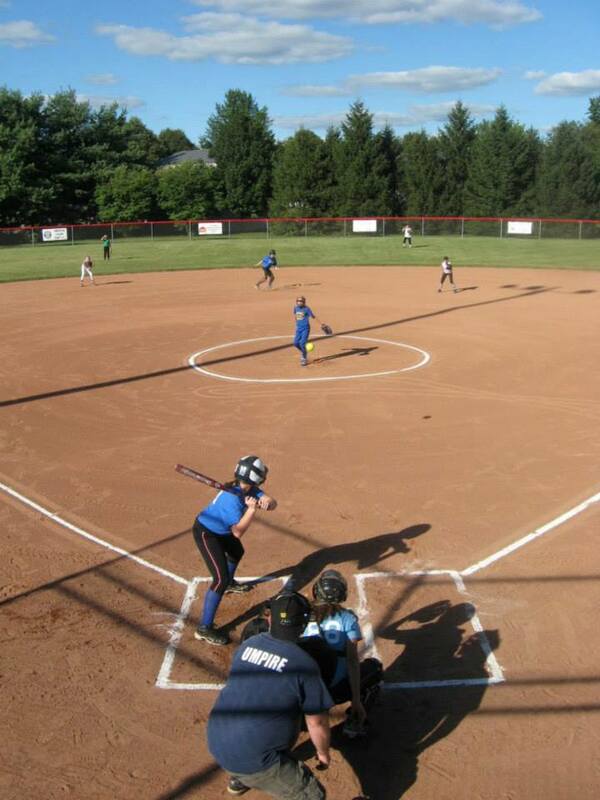 Edinburgh Girls in grades 6/7/8 can participate in our Middle School Softball League. Boys 13-15 years can participate in our Babe Ruth League. Teams are allowed to have a maximum of 12 players so be sure to sign up soon! All players and parents/guardians must sign a code of ethics and liability form that is to be adhered to at all times. Our coaches are volunteering their time to help form the next generation of citizen's and must be treated with respect at all times. Players or parents will be asked to leave the park and possibly the team if disrespectful behavior occurs. If this is the case, no refund will be made! Let's all make this a great season together! If you are interested in volunteering or coaching a team, please email your information to tbeier@edinburgh.in.us. Background checks may be required. Registration for our Rec League Program concludes Feb. 17th. Registration is held at the Parks and Recreation office, located in the Sports Complex, behind Jay-C Food Stores. Times for registration are Monday-Thursday 8am - 8pm and Friday-Saturday 12pm - 8pm. Late registration begins Feb. 19th -March 3rd and has an additional $10.00 late fee. The first four weeks of practice will be scheduled through the Parks and Rec. These practices begin the week of March 28th. Additional practices is to be determined by coaches once teams have began playing games. All available diamonds are a first come first serve basis. Coaches must contact the office to inquire about availability and to schedule their additional practices in advance. T-ball games generally occur every Thursday. Softball games generally occur Tuesdays and Thursdays, occasionally Saturdays, while Baseball is Mondays and Wednesdays and occasionally Saturdays. Babe Ruth games will begin mid to late April and home games will be played at the Edinburgh High School Baseball field. Days will vary. Middle School games will begin in April and home games will be played at our Sports Complex. Days will vary. T-ball games always take place at either 5:30pm or 6:30pm. Softball/Baseball games begin at either 6:00pm or 7:30pm. All coaches will be contacted by 4:30pm on the game day in the event of a rainout or cancellation. Coaches are then responsible for notifying each parent/guardian. You can also call the Parks and Recreation office at (812)526-3535. Text messages will be received for those who are signed up for the Parks and Recreation text notification program. Updates will also be posted on our Edinburgh Parks and Recreation Facebook page. ball glove, cleats or tennis shoes, helmet (not mandatory, but strongly suggested), ball pants or shorts. Each team will have a couple additional helmets on hand for players to share. Girls in 8U/10U/12U/16U are required to have a face mask on their helmet. Additional fan shirts ($10) and fan team hats ($12) may be ordered by March 5th. Each additional sibling receives a $5.00 discount. We accept credit cards, cash, and check. Please make checks payable to Edinburgh Parks and Recreation. Tournaments take place after the season has concluded. Teams play a double elimination tournament in each division to win a large championship trophy and individual championship trophies for each player on the winning team. Once the tournaments have concluded each team is invited to the Awards Ceremony and pool party in which every player receives a participation trophy. One special player that has exemplified team spirit and dedication throughout the season will receive the "Sportsmanship Award". Each team will be able to attend an end of the season pool party at the Aquatic Center. The girls will have their pool party on Tuesday, July 12th, boys on Wednesday, July 13th, and t-ball on Thursday, July 14th. Enter into our new texting program to receive texts about rainouts or cancellations and other special events we may have going on for your family to enjoy! In order to join, text EPARKS to 36000.